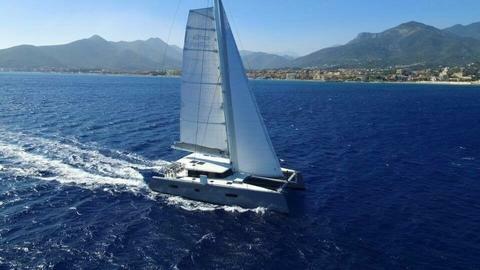 Norpol Yachting happily announces the new NEEL 47 - another successful blue water multihull from Neel Trimarans. Safety, performance and comfort of life onboard are all incorporated in her modern and elegant silhouette with sporty looks. The first boat hit the water mid February 2019. Welcome for a test sail in La Rochelle. From 24-28 April the Neel 47 will be shown at the Multihull Boat Show in La Grande Motte, followed by sea trials 29-30 April. Contact us for a VIP-appointment. The helm station allows safe maneuvering and sail handling short handed, as well as great communication with the cockpit. The layout of the boat is designed to ensure privacy for everyone. The trademark Cockloon® is an open indoor-outdoor area acieved by merging the cockpit and the saloon. The wide sliding glass door can be used to modify the layout of the space according to the weather and personal taste. The interior has a delicate and refined decoration, combined with natural light (numerous windows) which creates an immediate sensation of well-being. price: € 439,350, VAT excl. price: € 890,000, VAT excl.